Up until now Australians have not had much choice in rugged phone technology. But suddenly in 2019 you have two new rugged phone companies competing for your attention. One of them claims to be “Australia’s No.1 rugged phone store”. If they are not telling you the truth about that, however, can you trust any of their other claims and promises? 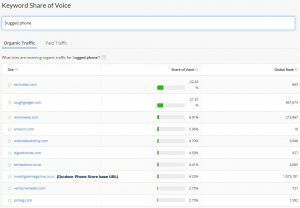 Our parent global brand, The Outdoor Phone Store (which began seven years ago as a division of Investigate Magazine and still uses its web servers), gets more Google search traffic for the phrase ‘rugged phone’ than any other retailer in the world except Amazon.com. 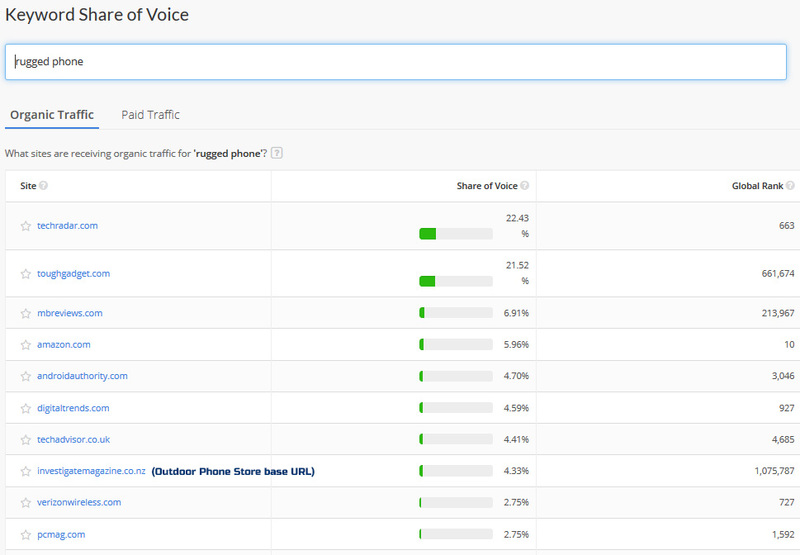 Even America’s giant telco Verizon Wireless comes in with fewer ‘rugged phone’ visitors than we do. 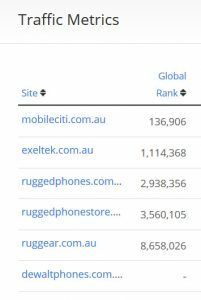 However, leaving aside Amazon and The Outdoor Phone Store global sites, Australia’s most visited local site for ‘rugged phone’ queries is actually mobileciti.com.au, followed by exeltek.com.au. (The list ranks websites by global popularity. The smaller the number, the closer to number one the website is). So where does that leave this site (ruggedphones.com.au) and our self-proclaimed “No.1” competitor ruggedphonestore? 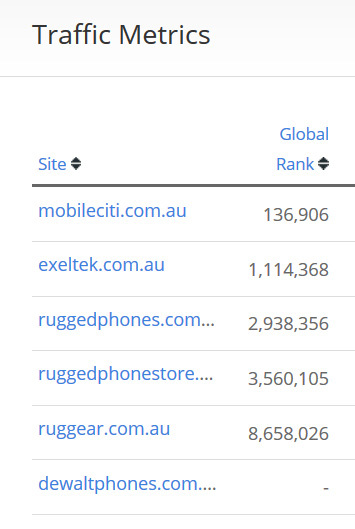 As you can see, we (ruggedphones.com.au) are #3 and that alleged “No.1” is actually Number 4, behind us. Ruggear comes in a distant #5 and DewaltPhones doesn’t even have enough visitors to trigger a registration. What is the moral of this story? We believe honesty in marketing is a must. If you can’t be trusted you shouldn’t be in business. We don’t claim the #1 slot for Rugged Phones Australia because technically we are not – although we are the leading specialist rugged phone site if you leave out stores that also sell other products. However there is no way in a month of Sundays that the competing Rugged Phone Store site can claim to be #1 – not even if you count stores that only sell rugged phones. And if they are misleading you about that, why would you trust them with a purchase? Secondly, and maybe it’s just us, what kind of credible store displays a front page photo of phone brands it doesn’t sell? Rugged Phones Australia is comfortable with you shopping around before you purchase. In fact, we encourage it. Up until now Australians have only had limited choice as we mentioned – you’ve been forced to buy the models pushed by the big telco’s or do without. We believe our range of the best international outdoor phones offer better features than the limited range of phones ‘officially’ available in Australia. We believe that when you compare our phones to what MobileCiti, Exeltek or others are offering, you’ll find ours have more RAM, more storage and better performance, screens and cameras than comparable Australian phones. Our prices include the import fees and import GST, and the backup needed for Australian repair and warranty support, because we are serious about offering you the best phones and service in Australia. The Outdoor Phone Store group has hands-on technical experience maintaining these phones (unlike other retailers who don’t have in-house service departments). We don’t palm you off to a ‘manufacturer warranty’, the buck stops with us. We are selling you the phone, we have the parts and the technical expertise, we’ll support it. We are not competing with cheap no-frills websites making misleading claims. If you want to take the risk on one of those that’s your call. We are competing with the big telco’s and their own ranges of rugged phones and we are offering a warranty as good as theirs.